Everything passes through the air: our looks, our emotions, our desires, our dreams. “Nell’Aria” is the new concept for the third album of “Appassionante”, the well-known female opera-pop trio. After an history of successes, meetings and passion, Overlook Italia is now glad to introduce next production of “Appassionante”: next album will really explore and meet the greatest arias of the world as nobody has done before. The best arias composed by the greatest opera composers will be read and interpreted here in a totally and original new modality. We re-propose the Italian Opera Tradition in a new style, mixing opera voice and modern languages. This is something that makes “Appassionante” project absolutely unique and special but also very popular. Air is a vital element in life and communication. Air has a universal meaning in our music and feelings. That is why the title of the album symbolizes both the concept of air itself and the concept of romanza and aria that we largely quoted in our album. Our intent was to give "Nell'Aria" a completely different angle to what today is defined as crossover genre. With this project we support the idea that operatic singing can also be modern and artistic expressivity. Up until ten years ago opera was a genre unexplored by modern singers. Today instead crossover is a overly-exploited genre: many artists covered famous songs performed in operatic style. We thought that it would not have been fair for us to propose again a cover album, as our intention was to distinguish ourselves from everything else. So we took the freedom of "stealing", that is to draw directly from the artistic treasure of the greatest opera composers and to deliver their music to the audience through modern melodies. In opera there are some arias that have never been exploited in a "popular" way by treating them as songs. That is why, together with our music producer Mauro Borzellino, we created original and modern compositions making these arias much more popular, like if they were real pop songs. It's like a journey into the past... as if great composers like Puccini, Rossini, Delibes, Mascagni, Beethoven (whom we drew inspiration from), were famous in our current age as nowadays artists like Elton John, Paul Mc Cartney, John Lennon and many others are. For example we discovered that Rossini today might have been, why not, an incredible deejay! And who would have never imagined that people could have danced on the notes of his dynamic and lively music? That's why we had fun to play around with the aria "Una Voce poco fa"! With "Nell'Aria" we dare to surrender ourselves to the beauty of these unique melodies, always respecting librettists' thought and intention. Nell'Aria is an album with a concrete and genuine concept, almost cinematographic. All the songs are independent but connected and blended with each other in a mix of composers, arias and thoughts. Find me - An original song that recalls "The Flower Duet" from Lakmè by the French composer Delibes. Amami - An original and passionate composition built around one of the greatest arias by Giuseppe Verdi, "Amami Alfredo" from "La Traviata". We used a tenor’s voice to enrich our interpretation. Una Voce poco fa - We had fun to playing with the unique dynamic style of Rossini, making this aria from Il Barbiere di Siviglia into a dance song. I don't know why - An original song of great social impact. In fact, "Nell'Aria" is also a way of seeing and thinking about things. Travelling around on tour we realized how much the world needs to be improved. Memories of you - Original song with the quotation from "E Lucean le stelle" an aria from Tosca by Puccini. We added a tenor’s voice to this as well. Inno alla gioia - What can be better than expressing ourselves through the Inno alla gioia by Beethoven! Maestrali - The name of a wind. It's a track which was proposed to us and has already been performed by us in the past. A perfect title for our "Nell'Aria" album! Aria - A totally original song fully expressing the concept of air as vital element. For (international) bookings contact Italian Entertainment And More! 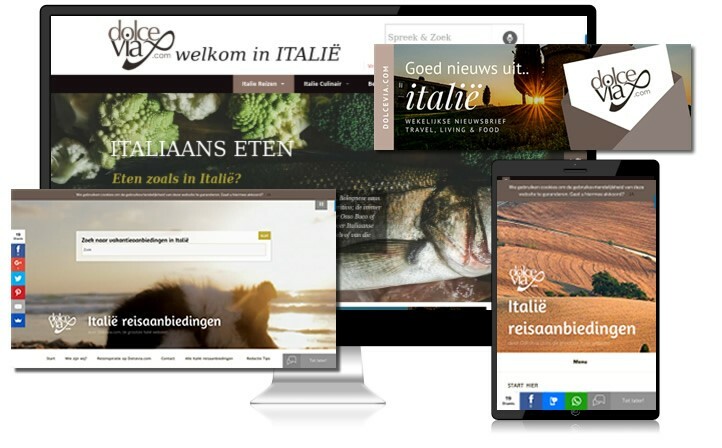 You can now promote your property or Italian SME company from € 14,95 per month. Advertise your Italian business or holiday property on Dolcevia.com and the new website Italië Reisaanbiedingen from € 14,95 per month.